I'm over on the Honey Bee Stamps blog today with this pretty pastel holiday card. I wanted to play with a mix of soft colors and glittery golds. Hope you'll join me over there! 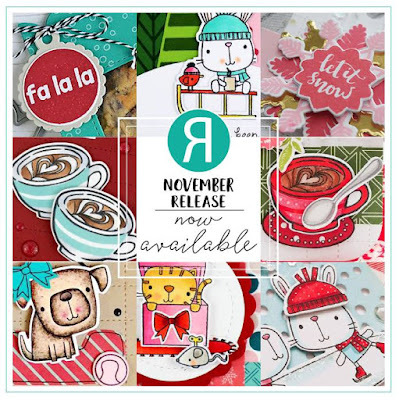 and is packed with some very fun winter themed stamp sets and stand alone dies. I'm sharing 4 cards today using some of the sets from this release. I've listed all the HB sets used along with a few highlights of each. For this card I've used the adorable Merry Pigs stamp set. The backdrop for the scene was created with the new Skating Pond Scene Die - minus the trees at the top. I used the tiny tree images from the Frosty Little stamp set instead. I used Chipped Sapphire Distress Oxide Ink and white paint splatters to create the night sky. To add a little shading to the snow drifts, I sponged on some Tumbled Glass Distress Oxide Ink. My next card features two of the cute critters from the Skating Party stamp set. I just couldn't resist using these cuties holding their to go cups of hot cocoa. The dusty pink panel was created by sponging on some Catherine Pooler Rose Petals ink and stamping the snowflakes from the Skating Party set in the same Rose Petals ink. I used a die from my stash to cut out the heart shape to house the little scene. I then used a combo of Stormy Sky and Tumbled Glass Distress Oxide ink to color the sky area. I stamped and white heat embossed the snow using the Falling Snow Backgound stamp. 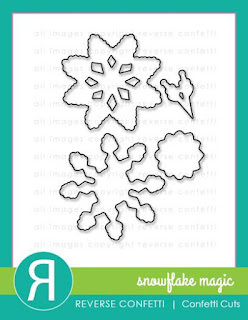 I added three silver heat embossed snowflakes which are from the Holiday Flurries stamp set. 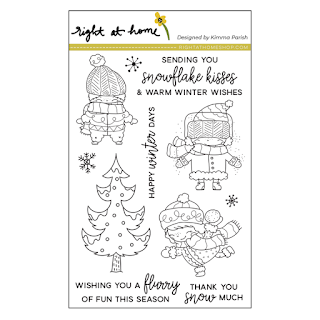 If you love snowmen then you will love this next featured stamp set - Frosty Littles. This set has everything you need to create a fun winter mountain scene with the cutest snowmen. I created four layers of snowy slopes using the Hill and Dale dies. I lightly sponged on Tumble Glass Distress ink to the slopes to add some shading and definition. I added details with Copics and a white gel pen to make the house look like a cabin. To give the mountain caps a little sparkle, I added some White Blizzard Nuvo Glitter Drops. My last card for today features the North Star Stamp set. This card is A6 size. I needed a little extra room to get everything to fit within the scene. I used the new Charlie Numbers dies for the 2019. I die cut the numbers out of post it note tape to create masks. I placed the number masks onto the background panel before I ink blended on the night sky color. After ink blending, I took off the masks revealing the white numbers. I wanted to up the sparkle of this card to I added some chunky glitter to the tops of the snow layers. I also adhered a scattering of clear sequins and tiny stars to the sky. from the design team using these newest sets all through the month of December. Hello crafty friends! 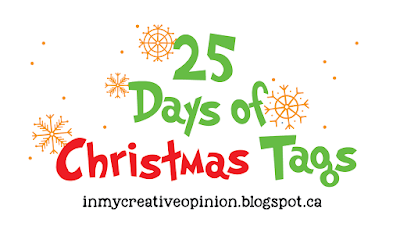 I am joining in on a fun tradition that Tracey McNeely has hosted each year - the 25 Days of Christmas Tags. 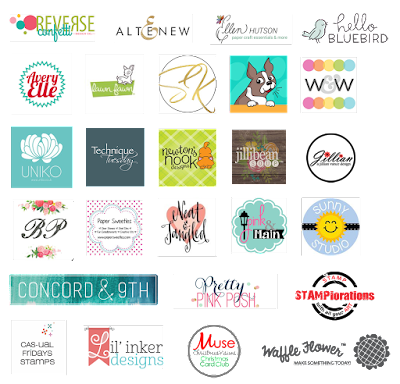 Please be sure to check out her blog and follow each day---> In My Creative Opinion. She will have a list of all the participants and links to their blogs. There are prizes that are being given away too so check out this post for more info. The tag I'm sharing today features traditional Christmas colors and the absolutely adorable images from the Joyful Mouse stamp set from Hello Bluebird. I've colored all the images with Copic markers and then cut them out with the coordinating Joyful Mouse dies. I created the green background layer by sponging Cracked Pistachio and Mowed Lawn Distress Oxide ink onto Bristol Smooth card stock. I white heat embossed the tiny stars over the green. The large "merry" is from the Christmas Words #1 stand alone dies. I die cut the bottom layer from red card stock and the top layer from silver glitter card stock and adhered them together slightly staggered. The stamped part sentiment is from Typed Christmas which I white heat embossed onto black card stock. My finished tag measures 4 inches tall by 3.75 inches wide. 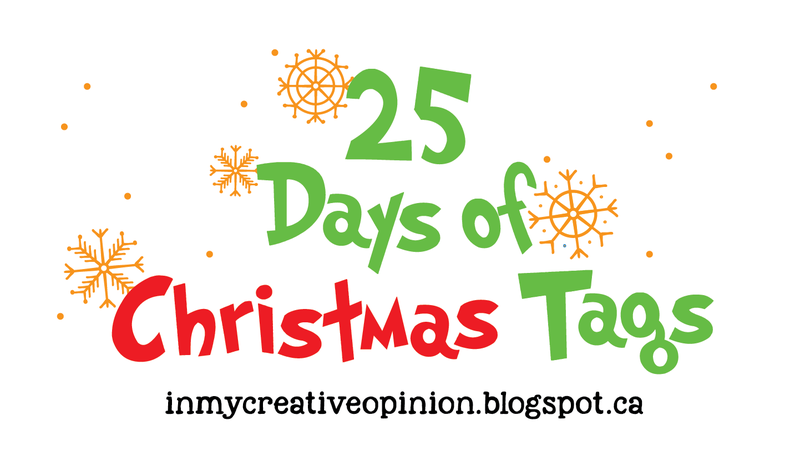 I am joining in on a fun tradition that Tracey McNeely has hosted each year - the 25 Days of Christmas Tags. Please be sure to check out her blog and follow each day---> In My Creative Opinion. She will have a list of all the participants and links to their blogs. There are prizes that are being given away too so check out this post for more info. 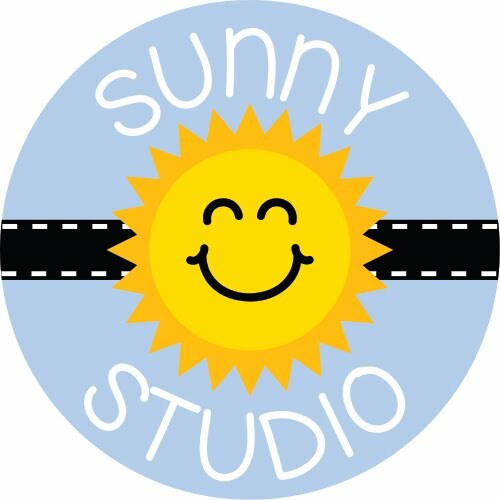 Today is day 24 and I'm sharing a tag featuring stamps and dies from Sunny Studio. which is from the Petite Poinsettias stamp set. I created a tag base with a die from the Build-a-Tag #2 die set. 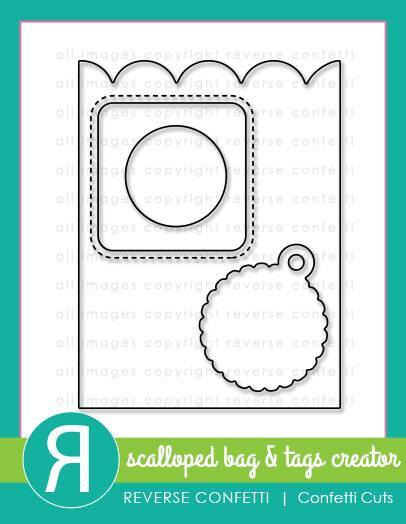 I used the gingham stamp from the Background Basics stamp set to add a decorative border to the tag. In the Sliding Window die set there's a smaller version of the same tag that I've used as my base tag. I cut one out from vellum and silver heat embossed the sentiment. I then layered the two tags while leaving some room to add the poinsettia and leaves. I have a card to share today featuring some new Holiday stamps from Purple Onion Designs. This was my first time trying their stamps and I have to say I'm in love with their cute designs. about their Holiday Sale that starts today and runs through December 7th. Maggie (Winter Mouse), Presents, Buttons (Winter Kitten), and Holiday Blurbs I.
I wanted to create a scene full of presents with the mouse standing on top jumping for joy and shouting "it's Christmas time!". The kitty was guarding the gifts but fell asleep on the job. I started with an A2 sized card base. I added some pattern paper cut slightly smaller. I created the large stack of gifts by stamping out the presents image three times. After coloring all the images with Copics, I fussy cut and layered them on a light aqua watercolored background. In the spot where I wanted to put the mouse image I trimmed off one of the presents. For those of you that were celebrating yesterday, hope you had a wonderful Thanksgiving. 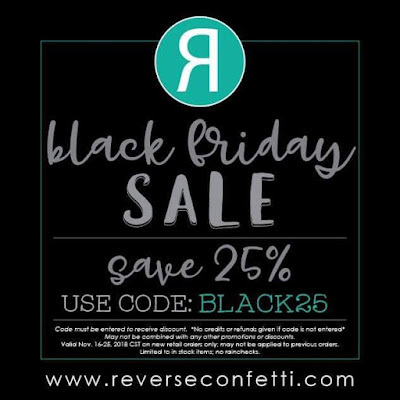 that the RC Black Friday Sale is still going on through the 25th. The card I'm sharing today features images from the new Furever Friends stamp set. I wanted to use the adorable image of the kitty in the box and make a card that has a Valentine's vibe. This is an A2 size card. I covered the front of the card with some red and white polka dot paper from the Winter Solstice 6x6 paper pad. I then used the Scalloped Squares Confetti Cuts to die cut a white and kraft frame. I added the frame at an angle and trimmed of the excess. I colored the images with Copic markers and used the Furever Friends Confetti Cuts to die cut. I added them to the card with foam squares for a little dimension. I stamped a sentiment which is also from the Furever Friends set. For a little extra embellishment, I added some stamped, colored, and fussy cut hearts which are from the Heart Spots stamp set. This is such a busy time of year and I'm always neck deep in holiday crafting projects. When I run short on time to get everything done I turn to quick and simpler solutions. 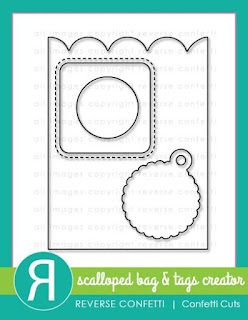 I'm sharing a quick way to make this festive Gift Bag with card enclosure. North Pole Littles stamp set and Charlie Alpha dies. 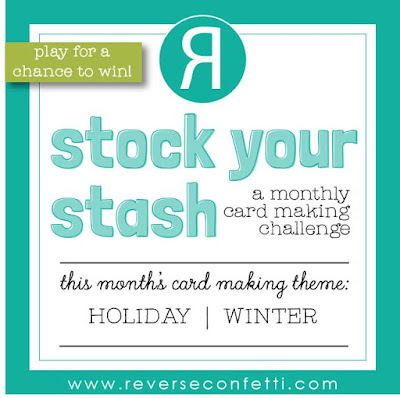 Today I'm playing along with the Reverse Confetti November Stock Your Stash Challenge. 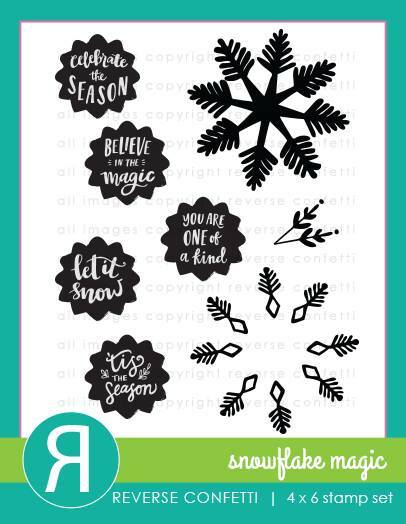 I decided to use the new Snowflake Magic stamp set and coordinating Confetti Cuts to make a wintery holiday card. I wanted to use a taller card format so I could fit on several snowflakes. The card base is 8.5 inches tall by 4 inches wide. I then cut a panel of Bristol Smooth card stock slightly smaller to create an ombre' background. I sponged on Spun Sugar, Tattered Rose, and Festive Berries Distress Oxide ink - keeping it light towards the top and going darker at the bottom. I added 7 snowflakes to the background. Three are die cut from plain white card stock and four are stamped and heat embossed with Ranger Silver Tinsel embossing powder. I stamped the sentiment with Festive Berries ink to coordinate with the background. I added a little dimensional embellishment by dotting the open spaces with Gloss White Nuvo Crystal Drops. Lastly I adhered a cluster of clear sparkling sequins to the center of the white snowflakes. from the new Snow Buddies stamp set. I'll be sharing two cards today. First up is a thank you card with a heart shaped cut out revealing a snowy winter scene. 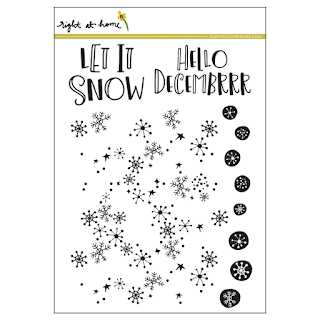 I've used the Snow Flurries Background stamp set to create a decorative panel that covers the entire card front. I sponged on some Spun Sugar Distress Oxide ink over my white heat embossed snowflakes. I filled in some of the open spaces with the small circle images and a coordinating light pink ink for a tone on tone look. I used a large heart die from my stash to cut out an opening for the scene. I've used Tumbled Glass Distress Ink to color the sky area for my little scene and then splattered with white paint. I added some glittery snow banks and layered my Copic colored images from the Winter Pals set on top. I heat embossed the sentiment in silver. To finish off the card, I added some dots of Silver Moondust Nuvo Glitter Drops and tied bakers twine around the left side of the card. For my second card I've used the Snow Flurries stamp again to decorate the front but added more colors. I sponged on Spun Sugar Distress Ink over the white heat embossed snow flakes. I used three different ink colors to randomly stamp the small circles in the open spaces. I used a large heart die to cut out a base for the image and sentiments. I lightly inked the edges of the heart with Peacock Feathers Distress Oxide Ink. I heat embossed the Let it Snow sentiment in silver directly onto the heart. I decided to create a collage with the heart, Winter Pals image, and another sentiment which is also from the Winter Pals set. To finish the card off I added silver heat embossed die cut snowflakes along with a few dots of Silver Moonstone Nuvo Glitter Drops. With the holiday's quickly approaching, I have been busy working on my Christmas cards but I wanted to make one last fall inspired card before those stamps get put away until next year. I've used a mix of Hello Bluebird stamps and warm fall colors to create my scene on an A6 sized card. I have stamped and Copic colored images from two diferent sets - Deer Friend and Fall Buddies. There's a deer image in each of these sets and I thought they coordinate so perfectly together. My go to Copic color combo for the main body area of deer is E42, E43, and E44. I use the E44 sparingly for shading in small areas. For the very light areas I've used E40 and E41. I've created an ink blended sky by lightly sponging on some Peacock Feathers Distress Oxide ink around the top and sides of a Bristol Smooth card stock panel cut slightly smaller than my card base. I used some Wild Honey Distress Oxide ink to color a circular area in the center of the background to mimic the sun. I used Brushed Sage Distress Oxide ink and the Grassy Knoll dies to create two layers of grass for the bottom of the background panel. I've stamped the "thankful for you" from the Autumn Script stamp set directly onto the background. I had a bit more room for an additional sentiment so I added the "you warm my heart" which is from the Fall Buddies set. Honey Bee Stamps - Have a Fa-la-liday! 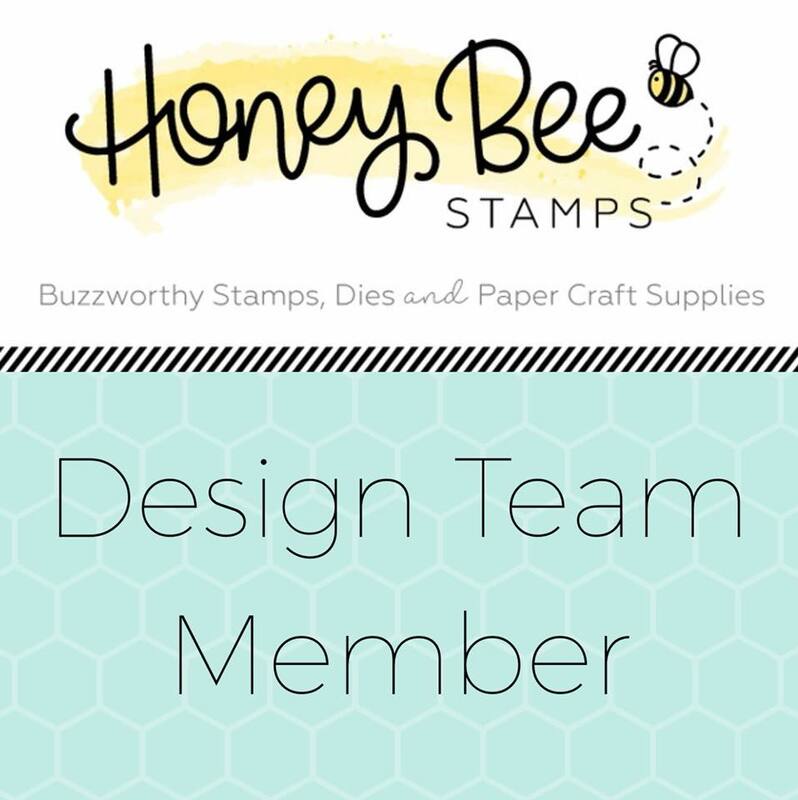 I'm over on the Honey Bee Stamps blog today sharing a fun and festive holiday card. I've used a mix of the newest stamps and dies so please join me over there for all the details! 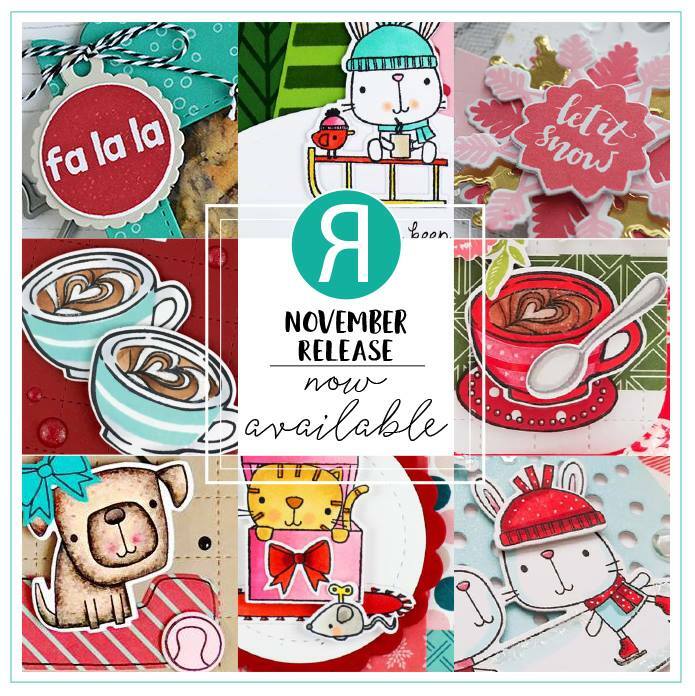 The Reverse Confetti November release is now available and we are celebrating with a blog hop. You should have arrived from Lisa Henke's blog. The next stop is Amy Rohl's blog. The complete hop list is at the end of my post. The card I'm sharing today that features my favorite set from the new release - Snow Bunnies. I started by preparing the background. I used the large die in the Scalloped Bag & Tags Confetti Cuts to cut a piece of Bristol Smooth card stock. I sponged on a combination of Mermaid Lagoon, Iced Spruce, and Cracked Pistachio Distress Oxide Ink. I then splattered the inked panel with watered down white paint. I've colored the images with Copic markers and used a white gel pen to add highlights and pattern details. The skating bunnies, bird, and sentiment are from the Snow Bunnies stamp set. The heart banners are from the Cured stamp set. For a little dimensional embellishment, I added dots of Nuvo Crystal drops in Gloss White. 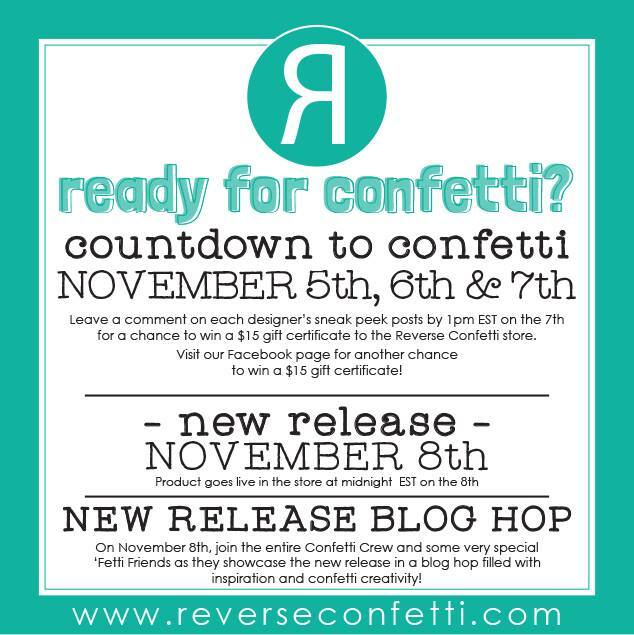 of the Reverse Confetti new release countdown. All the November release products will be available tomorrow! I wanted to showcase one of the snowflake images front and center on my card. I heat embossed the images in white onto dark grey card stock. I used the coordinating die to cut out the snowflake shape in a small square of white card stock. I then layered these pieces with foam tape. I used the largest die from the Scalloped Bags and Tags Creator Confetti Cuts to cut a scalloped panel out of white Bristol Smooth card stock. With Distress Oxide Inks I watercolored the panel. I used Spun Sugar, Dusty Concord, and Tumbled Glass. To add shimmer I applied some Nuvo Glimmer Paste over the entire panel. This basically makes a custom colored glitter paper. 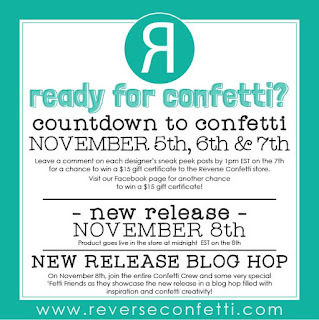 There are some prizes to be had during the Countdown days - $15 for one blog commenter and $15 for a Facebook commenter. Leave a comment on all the sneak peek posts for each designer and then head over to the RC Facebook page. Comments will close at noon CST on November 7th and the winner will be announced at 5 pm on November 7th on the Reverse Confetti Blog.